Edited by Erebus, Oct 14 2011 - 11:38 PM. So this is what you teased me on Gmail. I have no feelings about this. Maybe I do: AWESOOOOOME. Elmer's drawings are impressive as always. Edited by Vinyl Scratch, Oct 14 2011 - 12:26 AM. You can view the hi-res version on HS01, here: http://hf.biosector0...clusive_Art.png I'm just so happy with how this all turned out. It's very impressive work by the artists, and a good team effort on part of the staff to coordinate all this. I'm still amazed that you managed to commission the Hero Factory team for this image, ER. The results are absolutely incredible. So do you still need my colored version? Looks very epic. I like the blend in 2.0 and 3.0 gear, and how it doesn't have that Savage Plkanet feel. Not hating Savage Planet, but just the scenery and the gear design work together better in this picture than if he looked more 3.0-Savage Planet-ish. Amazing piece of art. However... Couldn't he just fly up? Regardless, this is awesome in every way possible. Couldn't he just fly up? Haha, I suppose. 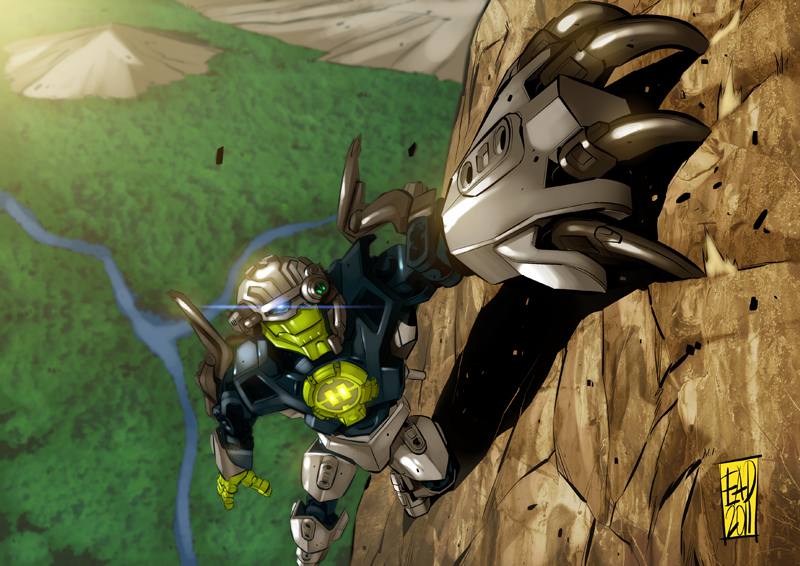 His description on HeroFactory.com stated that the claw was specifically for climbing; when I was tossing ideas at ER, I thought it would be cool to have some kind of rock climbing pic. ER found http://www.majhost.c...limbing-gym.jpg this image to use as inspiration, and it evolved into the final product you see today. Wow, impressive. Great job, Damaso, and of course, thank you Erebus and all of HS01 staff for getting Damaso to draw this! ~Gata. Awesome. Many thanks to Elmer Damaso, DAC, and the HS01 staff, all of whose initiative made this possible! As for why he's climbing, flying would have made him a more obvious target for whatever's waiting for him at the top of that cliff. Or maybe some other reason. Coming up with a reason that makes sense isn't too hard. If nothing else, Hero Factory gave us Elmer Damaso. This is an amazing piece of art, brilliantly colored, and another piece of proof that the Lego Company hires awesome artists for their comics. Wow! This is a nice piece of art! So this is Elmer Damaso's work? That's interesting because it seems quite different than his work in the comics that I have seen. Do we know of any other things he has done for Hero Factory besides the comics? DISCLAIMER: All opinions and contributions made under this account are based solely on my own personal thoughts and opinions, and in no way represent any of the above groups/entities. If you have any concerns or inquiries about the contributions made under this account, please contact me individually and I will address them with you to the best of my ability. We should be thanking Dorek for conceiving the idea of having Merrick Fortis 3.0 drawn and colored. I didn't notice that he had proposed the idea. That's pretty awesome! Thank you very much for this Dorek! Edited by Meiko, Oct 14 2011 - 04:12 PM. I think it's mostly because each of these sketches is peak performance; if you look at, say, OoF's last panel, Furno 2.0 is at a weird angle, and is basically background material; Stormer 2.0 is the main point of that picture. Here, you have it devoted to a single character, so you get max focus, and the same applies to the coloring. By the way, is Elmer Damaso still illustrating the comics, because didn't Jesse Peyronel do the art for Savage Planet? Jesse Peyronel was the story writer for Savage Planet, not the illustrator. Elmer Damaso is still illustrator, at least until the end of 2011. Cool! A great work of art from a great comic artist. Love this pic. I may not be a big fan of the factory, but that doesn't take away from this great image. The scenery is just beautiful, and the hero looks very detailed. Not to mention how this full body shot will make custom versions much easier. I love this. 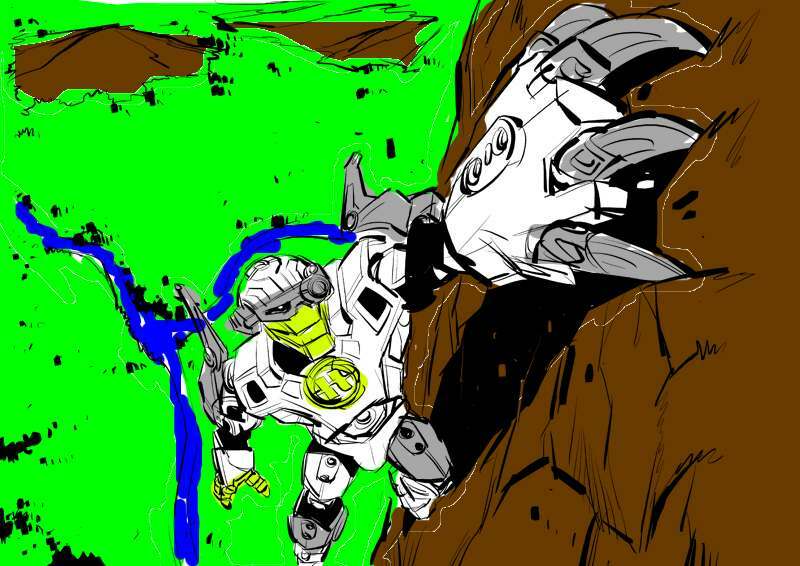 Looks sort of like a comic book, yet sort of Bionicle. And the land down there reminds me of Mata Nui. Anyway, this is great. Really looks like him. I like the lighting, especially how it makes Merrick Fortis's eyes and hero core glow. I'd love to see a step-by-step of how this picture was made. Any chances you think we might get something like this again any time soon? Give us some cash and let's find out. Man that's a beaut. Especially loving the zoom-in lens. That green is so pretty. With the clamor of anvils and the thunder of guns, we rip each day from life's teeth. Wow. I know Damaso did Transformers comics, and once I learned he did the HF comics, I was quite pleased.This is one cool piece of work. I love seeing stylized artwork of sets. And I particularly like how he made this look realistic, but still set-accurate for the most part.Big thanks to everyone who worked on getting this picture! KalhikiFirst post on the new forums for me! Boy! I just love it when my computer doesn't tell me when my battery is getting low! Wow. I know Damaso did Transformers comics, and once I learned he did the HF comics, I was quite pleased. Really? I never knew he did that. How long has he been doing them? I haven't been following HF enough to know who this is, but this art is awesome in ways I can't begin to describe. Not a Hero Factory fan myself, but that artwork is outstanding. So much effort, and it came out terrific. Good job, Mr. Damaso; and thanks HS01 Staff. I like the slight distortion on his claw. It makes you really see how he's falling down that cliff. So it's so popular to our HEROsector01 crew that all of our staff have it as their profile pictures. I have to say, it makes a great profile picture, but I can't tell anybody apart eaasily anymore. Did anybody notice that he doesn't have an awesome Hero Recon Team chest plate?